Summary 2-bay NAS based on Infrant's X-RAID technology with flexible media serving. An article entitled “Digital Focus” in the St. Louis Post-Dispatch on June 1, 2008 led off with the headline “As consumers grapple with how to store and preserve digital photos, an entire generation of family memories is at risk.”. The article goes on to cite statistics that “the average online adult owns nearly 1,800 digital files..., yet 52% make no effort to back up these critical these files!” Closer to home, just this week one of my neighbors contacted me looking for help on their family PC which holds all their pictures yet will no longer boot. 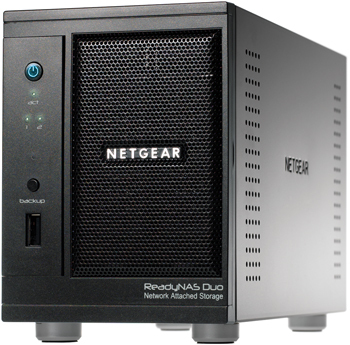 In this review, we're going to look at Netgear's ReadyNAS Duo, a dual drive NAS with a wide array of media storage and sharing features, providing a solution for the 52% of us needing to secure our family memories before we lose them. With their acquisition of Infrant Technologies and its ReadyNAS products in early 2007, Netgear has a suite of Network Attached Storage products to meet the needs of Home, Small Business and Enterprise level customers. The Duo is the member of this product line targeted at the Home user, and it is certainly a step up from Netgear's earlier NAS offering, the SC101. Physically, the Duo is a solid, yet compact device in an all black metal case, measuring 5.6”x3.98”x8.7” (h/w/d). By comparison, it's not quite as tall as a Buffalo Link Station, but a little deeper. The front panel is magnetized so it stays closed easily and closes itself when left open at less than 45 degrees. The front of the device has a single USB port, with two more USB ports on the back. There is also a Kensington style security hole in the back for physically locking the device in place. The power supply is an external brick that plugs into the back of the device. The exhaust fan is also in the back and is pretty quiet. There is a nice electric blue illuminated On button on the front of the Duo to fire it up. As the Duo boots, the internal cooling fan spins up to full speed and is relatively loud, but drops to a very tolerable hum within 30 seconds. Internally, the Duo has 256MB RAM and 64MB Flash memory, providing responsive computing horsepower for configurations and support for multimedia network services including SlimServer, iTunes, UPnP AV, a "Home Media Streaming Server" and standalone BitTorrent functionality. The slideshow which has some good shots of the front, back and internal workings of the Duo. With the drives pre-installed, installing the Duo on my LAN involved plugging it in to power and to my network. I connected the Duo to a Gigabit Ethernet switch, and was pleased to see the interface negotiate to Gigabit network speed. Included with the Duo is Netgear's RAIDar software which is used to find the device on a LAN. It is a simple little application that presents a radar dish icon (Figure 1) while it scans your network for the Netgear Duo. In less than 10 seconds, RAIDar discovered the Duo on my LAN and provided an output showing information about the device including the Duo's IP address and Host Name. The RAIDar software also has Setup and Browse buttons which provide direct links to the Duo's Admin configuration and to the pre-configured Backup and Media shares. Configuration of the Duo is web based, using a secure HTTPS connection. I was able to configure the Duo using IE7, Firefox and Safari. There are nine different menu choices along the left that, once selected, bring up additional configuration options accessible via a drop down list on the left or tabs across the top. Table 1 below is a matrix of the Duo's configurations options.